This post was written by our FLVS Full Time Elementary Principal for 2018-19, Mr. Marc Rummler. 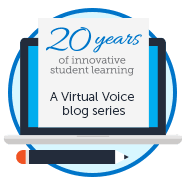 Even though it seems early, now is the time to start thinking about next school year for many FLVS families and parents across the state. With enrollment for FLVS Full Time now open for the 2018-19 school year, I would like to share a bit about what our online school will offer our younger students for the upcoming school year. 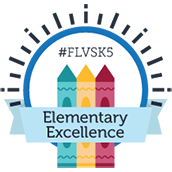 This year, FLVS Full Time is looking forward to accepting students in grades Kindergarten – 5 with a new elementary curriculum. As the new FLVS Full Time principal for our elementary school, I am excited to share a bit about myself and a few details about our plans for the lower grades at our school. I spent more than 30 years in a brick-and-mortar school district with the majority of those years as a principal. I was fortunate to open two elementary schools during my career and I look forward to transitioning to our new FLVS Full Time Elementary program. For the past 18 months, I was a principal with FLVS Flex Elementary. I am so impressed with the way our teachers connect with our families. Relationships are the key component of any successful school and are the pillar of our program. Together we are looking forward to building a successful school where students will thrive and enjoy learning. Hire staff who share our FLVS commitment. Our teachers and staff put the student at the center of every decision made. Assign students to one teacher for all their core classes. This is an important component to building relationships. This will allow teachers to truly know their students and the students to know their teacher. Teachers will contact families monthly, at a minimum. Hold regular live interactive lessons called Class Time. This provides students the opportunity to collaborate with peers and interact with teachers in a group setting. Use curriculum developed by our own experts. Our new curriculum meets the Florida State Standards and all resources will be available online. Textbooks will not be used, but offline projects and activities will be available to help young students engage in hands-on learning. Offer students the opportunity to participate in a variety of school clubs. We will offer a variety of extracurricular opportunities for students to get involved and explore their interests. Have field trips, morning announcements, and other school-related activities. Our students will have the opportunity to lead morning announcements, attend field trips, and more. Other activities include our student vocabulary parade, Hour of Code, and Celebrate Literacy Week. We will also gather information from students to host additional activities and events. Gather feedback from parents and guardians. Throughout the year, we want to hear your thoughts through surveys and committees for continuous improvement of our school. We’re looking forward to an exciting year! If you’re interested in being a part of our FLVS Full Time Elementary school community for 2018-19, register for an upcoming info session to learn more. Mr. Marc Rummler has more than 30 years of experience in education and administration. Before transitioning to FLVS Full Time, he served as a principal for the FLVS Flex Elementary program. He is looking forward to growing the FLVS Full Time Elementary school community. This entry was posted in Full Time Edition, Parent Edition and tagged Elementary, Florida Online Elementary School, FLVS Full Time, FLVS Full Time Elementary, FLVS Full Time Enrollment, Meet our Team, Online Elementary Curriculum, Online Elementary School, Student Activities, Virtual Elementary Education, Virtual Elementary School on March 27, 2018 by Guest Blogger. We registered our daughter for kindergarten when enrollment opened this year. Just wondering when will we receive the acceptance email and box of supplies? Hi Sandra! Thanks for reaching out. Our Full Time elementary option will be changing this year so all content is available online (nothing will be sent in the mail). You should receive updates on the status of your application via email. You will need to ensure that you provide all necessary documents when registering through Focus, our online system. You can find details about the process and everything that’s required at http://www.flvs.net/EnrollFT. You can also email InfoFLVSFullTimeElementary@flvs.net for assistance!